Dinosaurs were a group of reptiles that first appeared during the middle of the Triassic period, perhaps about 230 million years ago. They gradually became the dominant vertebrate animals on land, displacing (for example) the surviving mammal-like reptiles, and included both carnivores (meat eaters) and herbivores (plant eaters). Dinosaurs then continued as the dominant land animals throughout the rest of the Mesozoic Era (the Triassic, Jurassic and Cretaceous periods), only finally going extinct at the end of the Cretaceous period, 65 million years ago, in what is known as the Cretaceous-Tertiary mass extinction. For many years it was thought that dinosaurs did not all share a common ancestor (“polyphyletic”), and that several groups of animals independently evolved similar adaptations due to similar environment pressures. Today however, many scientists do believe that all dinosaurs did evolve from a common ancestor. The first dinosaur is thought to have been a small bipedal predator that evolved from archosaurs about 230 million years ago – many paleontologists have suggested that Eoraptor (a dinosaur that seems to fit this description and whose fossils have been found in Argentina), or perhaps a close relative of Eoraptor may well have been the first dinosaur. After dinosaurs appeared they continued to evolve, quickly dividing into two main groups – the ornithischia (“bird hipped” dinosaurs) and saurischia (“lizard hipped” dinosaurs). The former group included Stegosaurus, Ankylosaurus, Iguanodon, the duck-billed dinosaurs, and the ceratopsians such as Protoceratops, Triceratops and Styracosaurus. 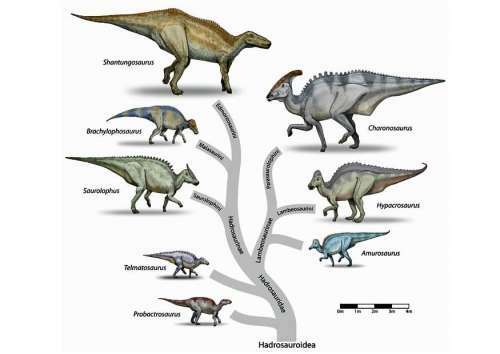 The latter group included the prosauropod and sauropod dinosaurs such as Apatosaurus (Brontosaurus), Brachiosaurus and Diplodocus, and the theropods, including Spinosaurus, Troodon and Tyrannosaurus rex. At the end of the Cretaceous period, all the dinosaurs (except for birds), as well as many other animals such as Pterosaurs, Plesiosaurs and Ammonites, died out. Most scientists believe that this was the result of some catastrophic event such as an astero/id impact or massive volcanic activity. In other words, it seems that the dinosaurs died out because of bad luck rather than bad genes. The dinosaurs’ bad luck was however the mammal’s opportunity – mammals which had previously been small mouse-size creatures were able to evolve to larger bodies sizes and into new ecological niches, and it was this event that eventually allowed humans to evolve.